A Twenty Mile House Wedding Photographer takes pictures that capture a little bit of history. The historical venue was first built in 1854 and served as a stagecoach stop. Since then, the property has undergone many changes, but the allure and enchantment of the location remain. As a Twenty Mile House Wedding Photographer, I took the picture above with the intention of capturing the magnificent scenery provided by the grounds of the venue. The evening sky was turning to dusk as I walked about the property with the bride and groom to take portraits. There was no shortage of beautiful, picturesque views for the pair to pose in front of as we wandered about the grounds of the Twenty Mile House. In this image the couple is standing on a small hill with the expansive Northern California forest as the backdrop. The image of the trees against the dimming blue sky is like a famous watercolor painting. 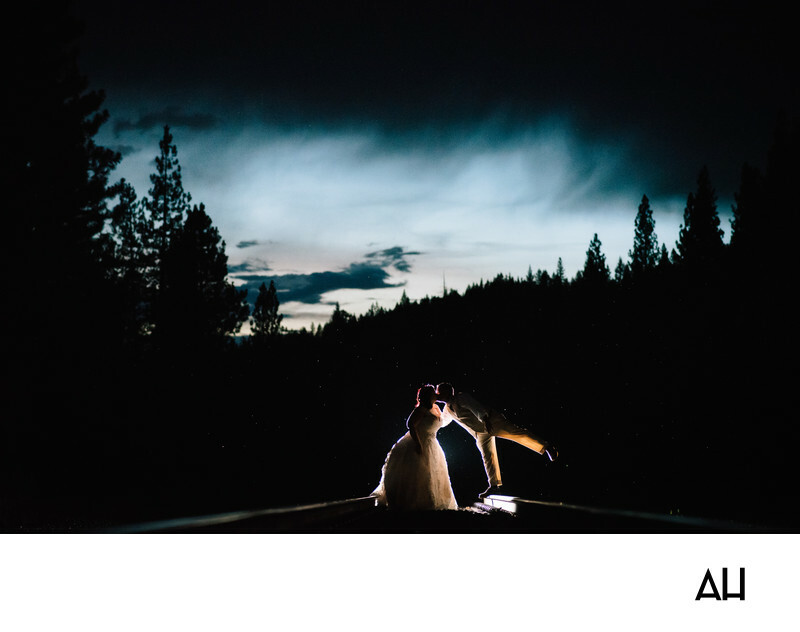 As the sky grew darker, I used a light that I placed behind the newlyweds to illuminate their figures. Doing this created an image that shows the couple glowing from the inside out, with the silhouettes of towering trees standing behind them. It is a picture that captures just how much fun the bride and groom have being with one another, and how comfortable they are together. The bride looks like Cinderella in her luminous ball gown. The groom balances on another light, leaning in to kiss his bride. It is an endearing, playful moment that is made magical in California twilight.